A media panel, featuring representatives of Austin's Dr. Who club, Vortex; the Hill Country Cartoon/Fantasy Organization; and the Star Trek club will be guest at Friday's meeting. The club meets at Mr. Gatti's. 503 W. Martin Luther King, Jr. Blvd. at 8 p.m.
APA 6th ed. : (1988-02-18). Science Fiction Society. Austin American-Statesman p. 2. MLA 7th ed. : "Science Fiction Society." 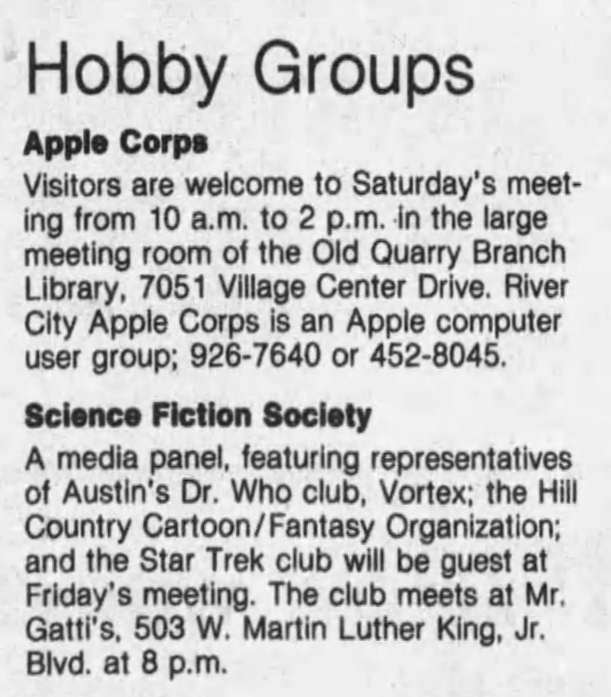 Austin American-Statesman [add city] 1988-02-18, 2. Print. Turabian: "Science Fiction Society." Austin American-Statesman, 1988-02-18, section, 2 edition. This page was last modified on 30 March 2019, at 22:11.